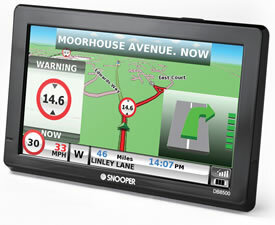 The Snooper DB8500 is a great sat nav designed by Snooper. The Snooper DB8500 includes 7-inch screen, DAB Digital Radio, DVB-T Digital Television and FM Transmitter so you can hear the sat nav through your vehicles radio. The DB8500 also includes FREE maps for the lifetime of the product, FREE TMC traffic information and is Bluetooth compatible for hands free calls. The Snooper DB8500 can feature an optional speed camera database. This will warn you to all fixed and mobile speed cameras via the GPS database throughout the UK and Europe whilst getting you from A to B. There is also My Speed database of speed limits included for FREE so you know the speed limit for every road regardless of whether there is a speed camera located along that road or not. You can store up to 16 multiple destinations along the same route for navigation. Plus you get Lane Guidance and Junction view along motorway networks. Although the Snooper sat nav range doesn't include radar or laser detection, there is another Snooper product which adds laser detection the DB8500 called the Snooper Laser Pod. To read the review click here. In total there are three different Snooper DB8500 sat navs these are: Syrius Pro, Truckmate Pro and Ventura Pro. While all three models have the same features e.g. a 7-inch touchscreen display, DAB Digital Radio, DVB-T Digital Telelvision, Bluetooth, FREE TMC traffic updates and FREE sat nav map updates. The different models are preloaded with different software, which are designed to get different motorists or more accurately different vehicles safely from A to B. If you drive a car or a small van then you need to buy the Snooper Syrius DB8500, if you drive a truck or larger vehicle such as a high top-van then the Truckmate DB8500 with its truck attribute database is the model you need. On the other hand if you regularly tow a caravan or drive a motorhome then the Ventura DB8500 is the model to buy. All three versions are available below, and with the exception of the DB8500 Ventura you can also choose between preloaded UK and Ireland maps or full Europe maps. To view the Snooper DB8500 PDF manual click here. Looking for more information on the features of the Snooper DB8500 sat nav or how it installs in your vehicle, etc? View the DB8500 manual by clicking the PDF logo below. The manual opens in PDF format. If you require additional accessories for the Snooper DB8500 Pro Sound these can be purchased via the Snooper DB8500 accessory page. The Snooper DB8500 will only operate on Windows computers. Specifically, you must be using Windows XP (32 bit), Windows Vista, WIndows 7 or Windows 8 / 8.1. Additionally the software will only work with Internet Explorer 6 or Netscape Navigator 6 or above. UK, Ireland, France, Spain, Portugal, Italy, Austria, Switzerland, Belgium, Holland, Luxembourg, Germany, Denmark, Norway, Sweden, Finland, Poland, Estonia, Lithuania, Czech Republic, Latvia, Liechtenstein, Hungary, Romania, Slovakia, Slovenia, Serbia, Montenegro, Croatia, Turkey, Greece, Albania, Bosnia & Herzegovina, Bulgaria, F.Yugoslavia Rep.of Macedonia, Russia. Snooper DB8500 Syrius Pro is designed for in car use and for small van owners and features here street-level maps for either UK or Ireland or all of Europe. If you drive a larger vehicle, such as a high-top van then we recommend you look at the Snooper DB8500 Truckmate instead below. To read more about the Syrius Pro please read more above. Snooper DB8500 Truckmate Pro is preloaded with truck data and attributes and is designed for use in large vehicle, coaches and HGV's and features here street-level maps. The Snooper DB8500 Truckmate Pro is available preloaded with UK and Ireland maps and also European map versions. The Truckmate Snooper Sat Nav also include AdBlue Petrol Stations points of interest database so you will always be able to find the nearest petrol station. There is also a car mode so you can use the satellite navigation system not only in your lorry or HGV but also in your car. Snooper DB8500 Ventura Pro is preloaded with caravan and motorhome attributes and is designed for use in caravans and motorhomes and features here street-level maps. The Snooper DB8500 Ventura Pro is only available as a European map version with no option for just the UK and Ireland. The Snooper DB8500 includes a free database of caravan sites and motorhome stopovers. In fact there are 20,000 campsites preloaded to the device throughout 31 countries. This database has been compiled using The Caravan Club, The Camping and Caravanning Club, ACSI, Bordatlas and Camperstop. You can search the database for facilities you require at a given/nearby location.